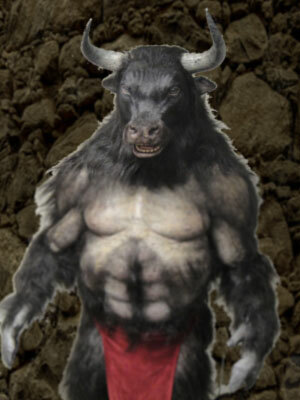 The Minotaur (Greek mythology), is another one of those monsters that started out as a single creature in mythology and then became an entire race of creatures. This is similar to Pegasus and Gorgon, who each began as a specific character in myth and eventually became the "brand name" of their race. Naturally, the king was not exactly thrilled that his wife banged a bull and gave him a mutant step-son, but it was pretty much his fault to begin with. It all started when King Minos decided to prove that he was favored by the gods by asking Poseidon (Greek mythology) to grant him a bull to come from the sea. In exchange, Minos would sacrifice the bull back to Poseidon as a sign of his dedication to the god. Poseidon agreed and sent a beautiful bull to the King. Apparently the bull was such a fine specimen that Minos had second thoughts about sacrificing it. In fact, he decided against it, and instead sacrificed a different bull to Poseidon. Anyone familiar with Greek mythology can probably guess what happens when you anger a god. When Poseidon saw that King Minos had tried to pull one over on him, he was understandably upset. Normally this would be the point where Poseidon would reign a tsunami or two down on the King, but this time he took a more subtle approach. Poseidon figured that if the bull was so beautiful that it couldn't be sacrificed, then it was beautiful enough for a human to fall in love with. And so he chose a human to fall in love with the bull. And that woman was King Minos's wife, Pasiphae. Immediately Pasiphae fell madly in love with the bull. So in love, in fact, that she lusted after it. After several months, Pasiphae gave birth to Asterius, the world's first minotaur. Minos freaked out and forced Daedalus to build a giant maze called The Labyrinth. He then forced his new stepson to live in the Labyrinth forever, sending seven young men and seven young women each year into the maze to serve as food for the minotaur. Eventually the original Minotaur's days came to an end when one of the seven youths, Theseus, eventually got to the end of the maze, and killed the minotaur. Since myths and stories have since contained more minotaurs, I guess it figures that either one of the ladies in the maze ended up as Mrs. Minotaur, or some more ladies tried on the wooden cow suit for size. Either way, the myth of the minotaur continues on. Return from The Minotaur of Greek Mythology to the List of Mythical Creatures.